Inverness boss John Hughes may try to replace striker Billy McKay and left-back Graeme Shinnie in anticipation of potentially losing them in the summer. McKay, vice-captain Shinnie, his fellow defender Josh Meekings and midfield pair Marley Watkins and Greg Tansey are out of contract in the summer. "I'm desperate to keep them but I'd be foolish not to be scouring the market," Hughes said of his January plans. 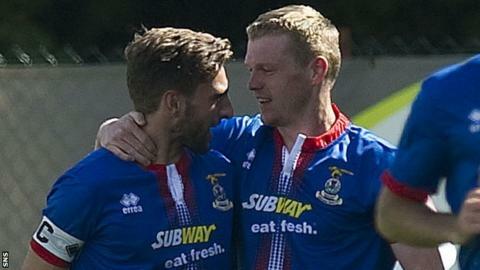 "I think Billy and Shinbone (Shinnie) have decided they might move on." Since joining from Northampton in 2011, Northern Ireland cap McKay, now 26, has scored over 50 goals for the Highlanders. Shinnie, 23, has spent all his senior career at Inverness and has skippered the side so far this season in the absence of Richie Foran. "Our priority is trying to tie up the boys that are out of contract," added Hughes, whose side are fifth in the Scottish Premiership. "They (McKay and Shinnie) might change their mind. And the other three (Meekings, Tansey and Watkins) have to let us know as well. "I've been there as a player, you do the best that you can for yourself, I totally understand that. "My job is to look after Inverness. If I see an opportunity to bring a player in, and it's their money that goes on that player, then they are the ones that are going to miss out. "If these guys are not going to commit, which we want them to do, then I just feel my responsibility is to take players if I get the chance. "It works both ways. It's a gamble. "Even if it's signing a player on a pre-contract for next season, I need guys who want to be committed to this cause. We can't be left in limbo, we need to make decisions."